Some things can only happen in Alabama. During the American Civil War, known locally as the War of Northern Aggression, Union warships settled in to a very effective blockade of Mobile. With cotton exports thus sealed off from the rest of the world, the state’s economy began to rapidly deteriorate. Something had to be done. William C. Powers, an architectural engineer from Mobile, had an idea. He drafted plans for a flying machine, lifted by two huge vertical rotating Archimedes Screws and driven by a pair of horizontal Archimedes screws, all powered by a steam engine mounted in the center of the craft. This machine would be used as a bomber, to destroy the Yankee warships hovering off Mobile and other Confederate ports, breaking the blockade and restoring the South’s economic power. Powers' model flying machine. National Air and Space Museum, NASM A-34342-A. Powers built a small scale model of his craft, but never completed a full-sized version – apparently family members feared the Yankees would capture the flying ship, mass-produce their own copies, and use them to rain fire and death upon Southern cities. They prevailed on Powers to hide his plans away, and there they remained, to eventually end up in the National Air and Space Museum. The ship does exhibit some very advanced construction techniques, with a lattice hull form that would have given it great strength but not a great deal of weight. It had a simple but probably effective rudder for steering, and Powers allowed for the anticipated weight shifts once bombs were dropped with a rolling weight to keep the ship level in flight. On the other hand, the Archimedes screws would not have provided either the lift or propulsion for which Powers hoped. In the 1930’s German engineer Anton Flettner (designer of the Fl.282 helicopter) devised a set of rotors that used the Magnus Effect (the aerodynamic force that makes a curve ball curve) to lift and propel a modified seaplane. 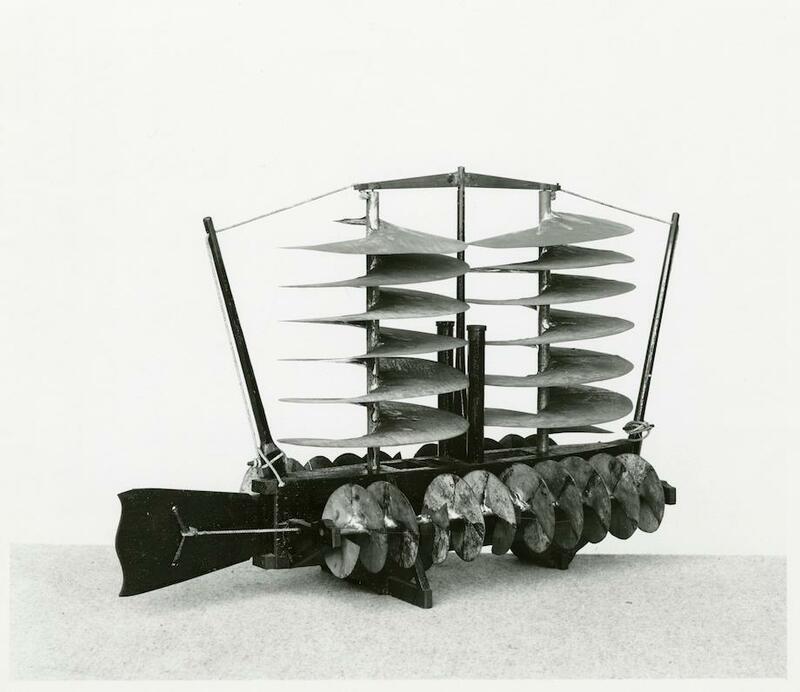 Could Powers have found success had actual field-testing caused him to turn his Archimedes Screws into Flettner Rotors? It would require a serious leap of intuition, but whatever the shape of her rotors, the enormous weight of the steam engine would have tethered the ship firmly to the ground. Other Southerners also looked to the skies as a means of smiting the Yankee invaders. Finley Hunt, a dentist from Richmond, Virginia, proposed a steam-powered aircraft to Confederate President Jefferson Davis. Davis in turn passed the draft to his military advisor, Robert E. Lee. Lee, an engineer by training, thought enough of the idea to seek input from the Confederate Army’s Engineer Bureau, where a committee of engineers pointed out that the great weight of the steam engine would preclude powered flight. In the war’s last year, Richard Oglesby Davidson, a Mississippi doctor, designed an ornithopter (a craft that flies with beating wings, like a bird) he called the “Artis Avis” and tried to raise money from individual donations to build a working model. A scale model pulled by a locomotive supposedly flew a short distance, but was later destroyed in high winds. Davidson hoped to bomb the Yankee siege lines outside Richmond and rescue the Confederate capital, and for some unrecorded reason Lee allowed him to tour the camps of Longstreet’s and Hill’s corps in the Richmond perimeter and make a pitch for cash. Davidson painted a fiery picture of divine wrath raining down upon the Yankees. “He wanted to sail over the Yankee camps some dark night,” one soldier recalled, “blow fire out of the mouth of this monster bird, and from a trapdoor drop shells in the Yankee camps, and thus stampede the Yankee army.” All this could become reality for only $20,000. The constant shilling for on-the-spot cash donations brought out the skeptic in Col. Asbury Coward, commander of the 5th South Carolina Infantry. Coward questioned the ability of Davidson’s machine to overcome the weight of its steam engine – the same objections made by Lee’s engineers to Hunt’s design – and Davidson grew increasingly flustered under Coward’s sharp inquisition. Finally, he told the colonel he could only reveal the craft’s secrets in private – after Coward made a cash contribution, which the future superintendant of The Citadel declined. Davidson finally slunk out of the camps, having made at least some profit on the exchange – Bratton’s Brigade, which included the 5th South Carolina, gave him $127 toward the machine. None of these machines were likely to fly; Davidson published his design in 1840, apparently lifting it whole from an 1833 drawing by H. Straight, another inventor, called “The Great Steam Duck.” Davidson’s fraud – and the impracticality of the original - was outed in 1841, but must have hoped no one would remember that detail a quarter-century later. Powers appears to have been sincere in his desire to smite the Yankees, and since we’re not limited by the laws of nature in Daily Content we can add Powers’ flying machine to our Chickamauga & Chattanooga game. In Dave Powell's Chickamauga & Chattanooga, add the two flying machines as follows. In all three Chickamauga scenarios and the Grand Campaign, place both flying machines with Bragg and Army headquarters in Area 177. In all three Chattanooga scenarios, both of them with Bragg (Area 325 in Scenarios Four and Six, Area 372 (Bragg should be included) in Scenario Five). The flying machines are part of the Headquarters formation, but are never Out of Command. A flying machine may move two areas per turn. Terrain has no effect on the flying machine. A flying machine may enter enemy-occupied areas (and indeed must do so to attack or terrify them). When a flying machine enters an area occupied by units of either side, the player controlling the ground units must a morale check against the Area Morale. Subtract one from the result if only infantry units are present in the area. If the check fails, the units lose one step (total, not from each unit). The owning player may choose the step lost, but it must come from a cavalry or elephant unit if one is present, from an artillery unit if no cavalry or elephants are present, and finally from an infantry unit if no cavalry, elephant or artillery is present. If the Siamese Elephant variant is in play, an elephant eliminated by aerial terror can also go on a rampage. When a flying machine enters an area occupied by Union units, it may attack them with bombs. The Confederate player rolls one die for each attack factor (each flying machine has two); on a result of 6, the Union units lose one step (Union player’s choice). Each flying machine may only make two attacks per scenario; the Confederate player may conduct them both at once or conduct them one each on separate turns. When a flying machine enters an area occupied by “long” infantry units of either side, the Union player rolls one die for each such unit (not per factor, but including Confederate units). On a result of 6, the flying machine is shot down and removed from play. Each time a flying machine moves, the Confederate player rolls two dice. On a result of 2 or 3 (2, 3 or 4 if the flying machine moved two areas), the flying machine crashes and is removed from play. Each flying machine must return to the same area as the Confederate Army HQ after six turns and remain there until the next game day (in a multi-day scenario) when it may take flight again. A flying machine that fails to return crashes and is removed from play. A flying machine that is shot down counts as one Confederate loss for victory purposes; one that crashes is not counted as lost for victory purposes. We’ve even provided new counters for the flying machine; you can download them here. Take flight! Order Chickamauga right now!